Shutter work by street artist Visual Waste (web | Fb) for Thompson Crooks Solicitors on the Shankill Road. Here is the second of two boards outside the Ulster Rangers Supporters Club (see also Doing Her Duty from a few days ago). The mural features a tram going under an Orange arch between the public baths on one side an Spin-A-Disc records on the other, surrounded by notable figures from the Shankill area. Many thanks to Johnny Dougan of Shankill Area Social History (Fb) for the information below! Please e-mail or add a comment with additions or corrections. Front, from left to right: Manchester United and Northern Ireland Soccer player Norman Whiteside (WP) and behind him boxer Davy Larmour and community worker Saidie Patterson (see WRDA), boxer Sammy (Cisco) Cosgrove, Senator Charlie McCullough (WP), Tommy Henderson, boxer Jimmy Warnock (original photograph here), Hugh Smyth (see previously Third Class Citizens), artist William Conor (see previously Conor’s Corner, Jack Henning (running), musician Belter Bell, writer Albert Haslett (Northern Visions interview). Atop the tram: on the left is Jackie Redpath of the Save the Shankill Campaign (note other members of the group with placard on right; Northern Visions has a documentary about the Save The Shankill campaign) and Jack Higgins holding his book The Eagle Has Landed (WP). Up there too is Miss Sands, the music teacher in the Girls Model School, and historian Bobby Foster (Northern Visions interview). On the stairs are May Blood MBE and above her D.I. Nixon. The north and west sides of the substation at Boundary Way in the Lower Shankill estate have been repainted, restoring the Union flag (M02467) and “UYM” (M02469) lettering in vibrant red, white, and blue. The other two sides, which previously featured “UFF” (X00249) and a C Coy. mural (M02466) are now blank and walled in. The third of three new panels celebrating the Apprentice Boys contains a long description of the Shutting Of The Gates in December 1688 and the Siege Of Derry, which was ended with the breaking of the boom of the river Foyle in July 1689. The other two panels were featured in For God, Ulster & Scotland | The Brave 13. A wide shot of all three is included below. Here is the second of three panels from a new mural on the Shankill Road celebrating the ties between Belfast and the Stirling & District Campsie Club, a branch of one of the associated clubs of the Apprentice Boys Of Derry. It features the cannon “Roaring Meg” (“presented by the Fishmongers Company of London 1642″) which is used as the seal for the club, the club’s flag which includes a red hand of Ulster, the key to the gates, and the emblem and coat of arms of the Apprentice Boys. For the first panel, see For God, Ulster & Scotland. “Formed on the 2nd May 1987 we have been at the forefront of loyalist culture in our area since then and were the first club in Scotland to have a Battle of the Somme Commemoration Parade. Since our inauguration we have formed many friendships with our brethren and bands from the province many of which are still active today. For many years the club has participated with Belfast Campsie Club at the closing of the gates parade in December. We have through the years had great affinity with the many bands from Belfast some who are unfortunately no longer with us. The club would like to thank the people of Belfast for their support and friendship through the years and to the people of the Shankill for giving us the privilege of this murals. Colourful work by Glen Molloy (Instagram) for Blackjack Tattoo Studio at the top of the Shankill Road. 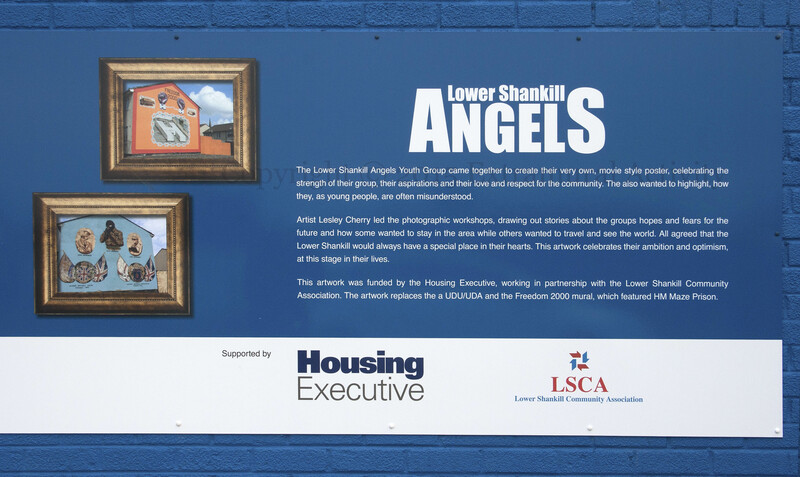 Today’s image is of the final new mural in the recent re-imaging of the Lower Shankill estate. It shows a patchwork quilt of word related to women and the roles they play in families and communities, such as “aunt”, “mother”, “sister”, “granny”, and “caring”, “diverse”, “strong”, and “unheard voices”. 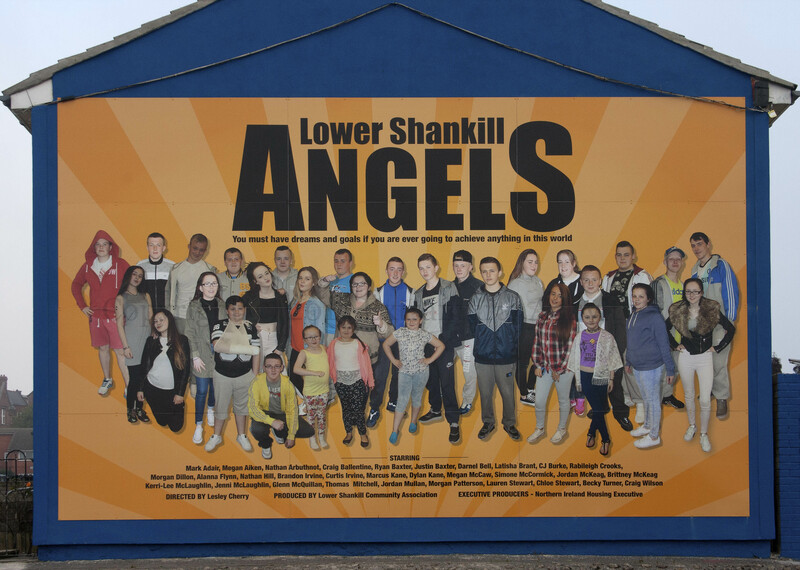 Young people from the Lower Shankill pose in the style of a movie poster: “You must have dreams and goals if you are ever going to achieve anything in this world.” The info panel (shown below) incorrectly states that the board replaces a loyalist H-Block mural (of which there were two versions: yellow (M02473) | orange) and, before that, a UDU-UFF-UDA mural; these were on different walls and this board replaces only the Maze mural. This is the second of five recently-launched murals in the lower Shankill. The first to be featured was I Am Not Resilient.